We’ve been home from Arizona for nearly a week and are finally settled back into a bit of our summer routine, except for the fact that the weather is very much like winter today. In fact we haven’t had more than a few hours of sun since we arrived back in Ontario! We did have a beautiful sunset on our first night, while we were parked in an empty parking lot for the night, and a lovely sunrise at 5:00 a.m. the next morning. The rest of the drive home was too long to get us there at a reasonable hour, so this is where we stayed, right near a Tim Horton’s! Our trip back to the frozen north was pretty much uneventful this time, with the usual high winds and gradually falling temperatures, although a little more severe than usual. I think it was a battle for Jim to keep the beast on the road at times. Even when we were stopped for gas it was rocking. My big excitement happened when we were driving through Indianapolis. The highway was so full of bumps that the motor-home was coming down hard and rocking. Dishes in our cupboards were rattling and I kept looking back to make sure no doors or drawers were opening. After a particularly hard slam I looked back to see the fridge door swinging all the way open and a can of ice tea hitting the floor just ahead of the suspension bar that had been in place inside the fridge to prevent such occurrences! I rushed back and tried to get the bar back into place, but the ride was too rough. All I could do was push the remaining items back on the shelf and slam the door shut. I picked up the fallen can and then rode the next few miles standing with my back against the fridge and my feet braced against the opposite wall until the road I felt confident enough that slamming had ended and the door might stay closed. We eventually got off the highway. I found a plastic basket to hold the bottles and jars of condiments and put them back into the fridge where they wouldn’t tip over anymore. I put the bar back into place and we were good for the rest of the trip. Lesson learned! The only stops we made were for food, gas and sleep. 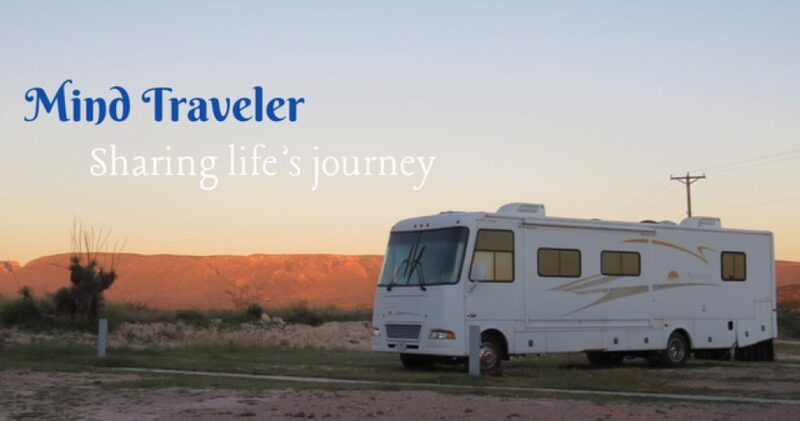 We tried a different RV Park in Tucumcari, New Mexico that was really interesting. A note in the office of Cactus RV said, “This is a business. No personal questions.” I wasn’t sure what constituted “personal” but I would love to have asked about the history of these old buildings on the property. We did have a few more interesting adventures in the Mesa area the last couple of weeks before we left for home. We took part in the Mesa Regal Polynesian Theme Day, playing ukulele with twenty-five other members of the band, while riding on a float, and then forty-five of us put on a concert on the patio, complete with the Hula Dancers from our neighbour resort. Jim was honoured with much appreciation from his ukulele students. We went once again to Tempe to the Aloha Festival. This time Jim spent an hour teaching beginner ukulele lessons. When he was done, we looked around the vendor stalls and then sought out our favourite lunch spot. It was a beautiful day to sit on the patio and people-watch. Several people stopped to chat when they noticed our Hawaiian shirts and leis. One day we drove out Bush Highway to search for wild horses, the one thing that Jim’s daughter Karen asked to do during her visit. We found some! From there we drove to Fountain Hills and then to Saguaro Lake where we had lunch at the restaurant overlooking the beautiful water. On Karen’s last day we did a hike on Superstition Mountain, led by our friends and neighbours, Dave and Pauline. It was another perfect day with a few clouds to keep us from overheating. An afternoon neighbourhood St. Paddy’s Day Party and then a trip to the airport with Karen pretty much ended that day. We fell asleep on the couch while attempting to watch a movie. and many sad goodbyes. But since we’ve both made commitments for the fall, we will be back! Many of you know from following me on Face Book that we are now in El Paso, Texas, stranded until we can get a windshield replaced. I won’t go into further details now, because I’d rather share some of the lovely trip we’ve had along the way before this problem suddenly hit us. Before now I’ve not had adequate internet connections to post anything. After his carpal tunnel surgery, Jim was forced to wait until October 17th before he had his second appointment with his surgeon and was given the green light for us to leave for Arizona. By then we had most of what we needed already loaded into the motorhome, and we’d planned to finish up some things in Peterborough while we were there, in preparation for leaving the next morning. Well, as usual, the best laid plans don’t always work out. The US money that I ordered wouldn’t be into my bank until the next day, and our barber wasn’t working that day. We got the rest done and figured we’d just stop back in on our way through Peterborough in the morning. We were up very early to load the remaining items, mostly the food and the electronics. It didn’t seem like much, but it was 10:30 by the time we got away. When we were finished making our stops in Peterborough it was lunch time. We picked up wraps at Tim Horton’s and then finally got on the road. We’d planned to go only as far as Jim’s cousin’s place which we thought was near the Windsor/Detroit border. They were expecting us for dinner. It was just a tad further than we thought, but we arrived by 6:00 pm, exhausted. After a delicious meal of organic beef and fresh vegetables from their own farm, a couple of their friends joined us for some old fashioned hymn singing. One son played his guitar and Jim played his ukulele. It was a lovely evening. The problem with getting together with long-lost relatives is that there is so much catching up to do and it’s hard to stop talking! Once again, we didn’t get on the road until after one in the afternoon. Therefore, we didn’t get too far that day either. We did have one new little adventure though. Dave had suggested we take a the ferry across the river from Sombra, Ontario to Marine City, Michigan, instead of our usual trip over the bridge into Detroit. It was small, and we had our doubts that there would be room for us, but they squeezed us on! It was a short and easy crossing into the US. From Marine City we just pushed onward. Traffic going through Detroit was very slow, taking us over an hour to get through the city. Shortly after 6:00 we crossed the state border into Ohio and forty-five minutes later we called it a night in the Walmart parking lot in Napoleon, about two hours from the border into Indiana. The sunset was beautiful. On day three we were up early and barreled right through Indiana and Illinois, stopping only for gas and meals. As usual, we got a little lost going through St.
Louis Missouri. We stopped at the KOA RV park in Stanton Missouri for a couple of nights so we could see the Meramec Caverns that we’d missed due to timing the first couple of times we were there. It had been raining off and on all day and was still drizzling when we arrived. The next morning we left for the Caverns. This year we don’t have our trailer and motorcycle with us, so we have no transportation other than the RV. Jim thought we would unhook it and drive down to the Caverns, but it was only three miles. I thought we could walk as it was a nice day. After the first mile of winding, hilly road with little to no shoulders, we stopped at a yard sale to buy a backpack for $1.00 because the temperature had climbed and we found our hands were too full with cameras and water bottles, and the sweaters and jackets that we no longer needed. When we saw the sign for a very steep grade, we knew we might be in trouble when it was time to climb back up. The going down was difficult enough. We think that the three miles was as the crow flies, not as the road turns! When we finally made it to the Meramec Caverns Centre, we had to nourish ourselves with pumpkin pie and coffee at the cafeteria before embarking on the eighty minute Cavern Tour. At the entrance to the Caverns is a large room that was set up with a stage and chairs, ready for the 150th Annual Gospel Sing that would happen later in the day. It wasn’t until we were about half way through the tour that we began to see the beautiful “decorations” inside the caverns, but it was a worthwhile, if pricey excursion. When we returned to the surface we considered buying tickets for the Gospel Sing, but I was just too hungry. We hit the cafeteria once again for lunch. Once back outside we watched people taking the Zip-line over the parking lot and river. If we hadn’t been so tired, and hadn’t seen most of the participants struggle to make it back to the stand on their return trip, we might have tried it ourselves. Of course the cost of $50 each was a little prohibitive too. We could postpone our trek back up the hill no longer, and we were right. We were in trouble. Half way up we started putting out our thumbs. The Gospel Sing had just ended and there was plenty of traffic, but the first half dozen cars passed us by. Finally, a nice senior couple stopped and cautiously allowed us into their back seat. I’m sorry that I didn’t get their names, but we had a nice chat and we were ever so grateful. We had walked over seven miles at that point, once again reminded that we are not as young as we sometimes think we are. We were in bed very early that night. December 8th in Mesa Regal! Yes, we did arrive safely without any more annoyances, last Wednesday. Although it wasn’t hot when we arrived, it was a whole lot warmer than the night before in Holbrook, and it was wonderful to be greeted by our neighbours. It’s like coming home to family. So much so that it takes a long time to get settled in because of all the stories to be shared as people pass by on the street. A couple of fellows helped Jim to unload the bike from the trailer and push the trailer into the lot, something I just didn’t feel quite confident enough to do this time. We love it! By the time we finally got things somewhat organized (slide out, floor swept, cooler outside instead in the middle of the floor, etc.) I was too tired to cook, so we began the walk to see what the Grill had to offer. We didn’t get too far. Our neighbours Bob and Cheryall saw us going by and invited us in to share their lovely meal of leftover beef and gravy with lots of veggies and salad. After the equivalent of a large glass of wine (Cheryall kept replenishing what I drank) to accompany it, all my former stresses had disappeared and I felt no pain in my hip that night while I slept. Thursday morning we were at the weekly coffee and donuts meeting held in Regal Hall, with some of our neighbours who’d saved us seats. This meeting is an opportunity for the Activity Committee and the Sales Team to bring us up-to-date on the coming events for the next week. When we got home from there, we sorted the laundry in order to take it to the laundry room. I searched everywhere I could think of, but I couldn’t find either of the two laundry cards that we possess. I had to buy yet another when I finally got to the laundry room that evening, while Jim went to the ukulele jam. Somehow we just never got off the block during the day. But our troubles weren’t over quite yet. On Friday when we did some grocery shopping at the very convenient Fry’s Store I discovered that the change they’d made at the end of last winter season, the one that caused my Debit Visa Card to become “unaccepted” was still not resolved. Fortunately I had some cash. Then we went to the fresh produce market across the street, where I had no problem using that same card last year, only to find that it no longer works there either. Back at the park, I went to the ATM to withdraw some more cash, knowing that was never a problem. The ATM was temporarily out-of-order! By the end of the day I discovered that somewhere along my journeys I’d lost the new bracelet that I’d treated myself to at the Country Store that morning. Saturday morning our fridge decided again that it was a freezer. Luckily most of the fruit and veggies I’d bought the day before were in the outside cooler. It was Sunday morning when Jim figured out how to fix that, and things started to turn around. We borrowed a neighbour’s car and drove to Phoenix to look for another car; Jim drove back in this 2003 Sebring! It seems to be a very good buy. We might not want to sell this one at the end of the winter. That evening we went out for dinner with a group of ukulele players, and then to the Mesa Arts Centre to see, again, The Ukulele Orchestra of Great Britain – another fabulous two hour show. Other than finding out that the local internet provider, Century Link, was unable to connect us up this year because the wiring at this, our new chosen site, is fried, the week has gone well. We went back to using a T-Mobile Hot Spot for internet. We spent some time watching the three-day Pickleball Tournament here in the park; I volunteered a couple of hours working in the kitchen selling lunches. We got the RV washed. Today I was pleased to see that my Debit Visa Card still works at Costco, and that I was able to dance to the rock and roll music of Come Back Buddy on the patio this afternoon. The temperature climbed enough for us to dig out the shorts too. Life is good (as long as I can ignore that little nagging feeling in my gut that something just isn’t right and trouble is on the way). That reminds me – better register with the Canadian Embassy. That’s all for now folks. Hope to have some new real adventure stories in the new year, but for now it looks like birthday parties and Christmas parties and bocce ball and maybe some pickleball are filling our calendar. WISHING YOU AND YOURS A MERRY CHRISTMAS, HAPPY HOLIDAYS, and a HAPPY NEW YEAR!